Bryan Logan/Business InsiderTesla Model S P100D. Tesla has issued its largest recall to date, involving the Model S luxury sedan’s power steering system. Five bolts holding the power steering motor in place can corrode and either come loose or break, possibly causing a loss of power steering. Manual steering would still work, the Associated Press reported. The recall affects some 123,000 vehicles worldwide, that were built before April 2016. Tesla has issued a worldwide recall related to the power steering systems in 123,000 of its electric Model S vehicles. Five bolts holding the power steering motor in place can corrode and either come loose or break, possibly causing a loss of power steering, the Associated Press reported on Thursday. Manual steering would still work in such a case. According to Tesla, the problem is infrequent and typically occurs in cold-weather regions where salt is used to clear snow and ice on the road. No crashes or injuries have been reported, the Associated Press said. 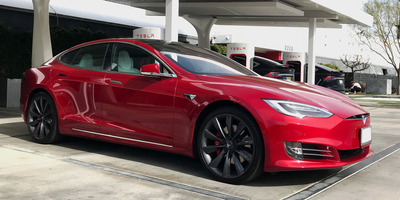 The voluntary recall is specific to Model S cars that were built before April 2016, but has so far affected only 0.02% of the Model S vehicles in the US that fall under the recall’s guidelines, Tesla said. Federal investigators are looking into a fatal crash involving a Model X SUV that crashed into a highway barrier in Northern California. Moody’s downgraded its credit rating due to ongoing concerns surrounding production of the Model 3 entry level sedan. Tesla’s stock has fallen about 25% over the last 12 trading days. A Delaware judge on Wednesday refused to dismiss a shareholder class-action lawsuit against CEO Elon Musk and Tesla’s board, over the company’s multibillion 2016 acquisition of the energy company SolarCity. There’s also the matter of Tesla’s balance sheet which is looking increasingly morbid ahead the car company’s first-quarter earnings report, which is expected in a matter of weeks. Tesla is also set to update shareholders on Model 3 production, which got off to a crawling start last July, and hasn’t yet touched the company’s original target of 5,000 Model 3s per week by the end of Q1 2018. Tesla slashed that target by half in January, promising to crank out 2,500 by the end of March. But it looks like Tesla is climbing to just over 1,000 Model 3 units per week, according to unofficial data from Bloomberg. In fall 2017, Tesla said it could produce 1,500 Model 3s per month by September, and 20,000 per month by December that year. The last major voluntary Model S recall occurred in 2015, when the company summoned the entire fleet over a single Model S vehicle that experienced a seat belt malfunction. “In order to ensure your safety, Tesla will proactively retrofit a power steering component in all Model S vehicles built before April 2016. (No other Tesla vehicles are affected.) There have been no injuries or accidents due to this component, despite accumulating more than a billion miles of driving.